Can businesses enhance their commitment to social responsibility during difficult economic times? That was one of the questions posed today at the Massachusetts Summit on Progressive Business held at the Harvard Club. The consensus of this gathering was that these troubled times create the exact moment for business leaders to make good on their social commitments. The president of Vertex Pharmaceuticals, Josh Broger, speaking at a morning panel, raised an interesting point. He cited the Massachusetts General Laws section on shareholder responsibility. Embedded within the statute was clear language permitting shareholders to factor in community and regional concerns to their corporate duty to seek profits. “You have permission … to be socially responsible,” he said. He was joined on the panel by the president of the Communispace Corporation, Diane Hessan. She said that the bulk of employees, who are members of the Millennial Generation, are demanding some corporate responsibility at their places of employment. Interestingly, this message directly gibes with what I heard from pollster John Zogby about younger Americans. Governor Deval Patrick, on a day when he focused on the economy, appeared before the gathering at a lunch. In my view, both the summit and Patrick’s appearance before it make a lot of sense. If there is any good to come out of a poor business climate perhaps it is the shared sense of commitment and responsibility that I heard from members of the business community today. In some ways, the Harvard Club parley reminded me of the Vault I have heard so much about from the days of old, where Boston’s CEOs acted as public citizens with the best interest of the future our city in mind. In that case, it will be up to the new generation of leaders, such as Jeffrey Bussgang of Flybridge Capital Partners, and Jim Boyle of the Sustainability Round Table, to help forge it. Occasionally this blog tells the story of the great personalities who comprise the fabric of the city, the ones who you won’t necessarily read about in the daily newspapers. One of those people died this week, Charlie Doyle of Brighton. If I were forced to reduce Doyle’s life to headlines, which is always difficult, I’d describe him as the leader — the innovator really — of a vibrantly progressive ward committee in Brighton, Ward 21, a long-time city politico, having run the City of Boston’s Cable Office under a number of city mayors, a political visionary and a Bostonian’s Bostonian. But I can’t really boil Doyle down to that, because he was much, much more. His story begins amid the simmering liberalism of the late 1950s and early 1960s — before it turned into the cauldron of the latter part of that decade. He graduated from the now-defunct St. Columbkille High School of Brighton and travelled down Commonwealth Avenue to attend Boston University. There he electrified fellow students with his encyclopedic knowledge of politics and history. Then he went even farther afield for a graduate program at Columbia University in New York City. New York, at that time, was a place of swirling intellectual and political foment. Charlie and I talked about that period in his life when I visited with him at the Cable Office in the mid-1990s. It helped power a intellectual engine, but he came back to Brighton to make a difference. When he came back, Charlie put into practice his knowledge of the burgeoning field of political science. At a time when most ward committee work was limited to distributing political signs, Doyle was turning it into a science. He gathered detailed voter data, compiled demographic information, and kept the best data bases in the city. My grandparents lived in Brighton for much of my life, and I thought I knew the neighborhood. That was until I called Doyle for a story. In painstaking — and delicious — detail, he broke down the differences between the liberal, but sometimes transient, Ward 21, and the more socially-conservative, Ward 22. He was a skilled photographer. His work, which was on display at his wake, could serve as a pictorial history of Boston with vintage photos of Kevin White, Larry Bird and others. He was ahead of the curve on a trend that has become very popular today, bicycle riding. I remember on him tooling around his bike at Nantasket Beach in Hull. He remained a political junkie until the end, relishing WGBH’s Friday night line up of political shows, beginning with Greater Boston. But, most of all, Doyle was the quiet creator of a political dynasty in Brighton. He took the two basketball-loving sons of his sister Mary under his wing and imparted to them everything he ever knew about politics. It was his gift. He bestowed it on the dogged and lovable Kevin Honan, who has become as reliable and earnest a representative as that neighborhood has ever had. And he delivered it to the charismatic, witty and talented Brian Honan, who served Brighton as a city councillor and then was running a rigorous campaign for district attorney, when he died suddenly and tragically at the age of 39 in 2002. I can’t say that Charlie was the same after that. But who would be. There was something awful about seeing many of the same faces at the funeral home on Chestnut Hill Avenue yesterday. Amidst the pain, people were talking about one of Charlie’s great final achievements. Back in 2005 and 2006 a former Clinton Administration official, little known in the Boston area, started making the rounds trying to meet people and build up a grass roots political organization. He was, of course, Deval Patrick. Most insiders met Patrick with indifference at best. Doyle was different. He welcomed Patrick to a ward committee meeting. There he grilled the would-be governor. Why was he any different than any of the other great progressive candidates, whose candidacies failed after great fanfare? Patrick convinced many in the ward that he was different. He took 14/18 delegates at the caucuses that year. With Doyle’s departure, like the death of Boston-chronicler Alan Lupo a couple weeks ago, the city is a poorer place, one more in danger of losing its character and characters. Watch me here and here on NECN NewsNight. Here’s what we have to say about Barack Obama. The other guests are Warren Tolman and Bob Parks. Barack Obama’s appearance in Boston last night with Governor Patrick prompted me to write about how the governor’s performance might foretell an Obama presidency. 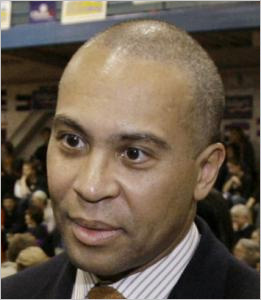 “In Massachusetts, where his friend and political ally Deval Patrick won the top office by campaigning in an eerily similar fashion to Senator Obama, voters have a Petri dish to examine what the Democratic candidate’s presidency might be like should he win in November. Comparisons between the two men are in order once again. Mr. Obama celebrated his 47th birthday in Boston last night at a $4 million fundraiser with Governor Patrick at his side. Like Mr. Obama’s campaign, Mr. Patrick’s was heavy on sweeping rhetoric and increased expectations. Advised by, among others, David Axelrod, who is also Mr. Obama’s chief strategist, Mr. Patrick offered state voters the prospect of great change. “Since taking office Mr. Patrick has been a vocal proponent of Massachusetts becoming a national and international center of biotech research. He pushed for the passage of a $1 billion life sciences initiative and was named “Governor of the Year” by the Biotechnology Industry Organization. His courageous decision to campaign on behalf of a controversial wind farm off the coast of Cape Cod, Cape Wind (even when it was opposed by Senator Kennedy), has looked better with energy costs spiraling upward. I often take a moment to reflect upon the trajectories taken by local writers and political pundits. One political analyst who continues to elevate his game is Jon Keller of WBZ-TV. Keller began the process when he published “The Bluest State” last year. He followed up on that success with a thoughtful essay in The Wall Street Journal on Saturday. In it, he revisited the similarities between Governor Patrick and Barack Obama. “Education may be the one area where Mr. Patrick could have done the most to demonstrate that he is indeed a new man of the left. Fifteen years ago, the state enacted strict testing requirements for both teachers and students and passed reforms that encourage the creation of charter schools. The result: Massachusetts consistently places among the top performers on the National Assessment of Educational Progress. Sticking by these bipartisan reforms – or even expanding them to help minority children in poor areas – would seem to be an easy call. Governor Deval Patrick has a history of taking brave stands for progress and civil rights. He headed up the Civil Rights Division in the Department of Justice in the Clinton Administration. He became the first ever African-American governor in Massachusetts. Now, according to Matt Viser in today’s Boston Globe he earns his place in Massachusetts history as the first ever Massachusetts chief executive to shave his head. Hats off to him. Of course, I’ve got a stake in this battle as well and thank the governor for his courageous leadership.